Hollywood High. 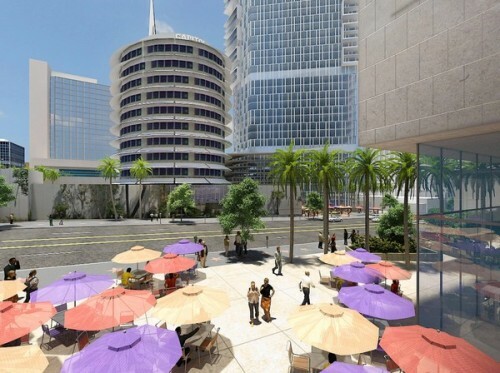 Promising to make the old Capitol Records building the jewel in a $1 billion real estate crown, developers Millennium Partners and Argent Ventures are proposing to revamp a large swath of Hollywood by clustering one million square feet of multi-use development around the famous tower. The developers told the LA Times that community input will influence the design and that the building where Nat King Cole, Sinatra, and the Beach Boys made their magic will hopefully remain an entertainment hub called Millennium Hollywood. Race to the Finish. Philly’s Race Street Pier is now complete and gets the ball rolling on the Delaware River Waterfront‘s master plan. The new pier runs just slightly south of the Ben Franklin Bridge and park designs reinforce the span’s perspective. A single file line-up of 37 swamp white oak trees march out toward Jersey. PlanPhilly‘s got the all the details. Midblock Crosswalk. DNA has been following the push by Midtown residents to clear the way for little known pedestrian arcades and corridors that run from from 51st to 57th Streets between Sixth and Seventh Avenues. At the moment, cars block the privately owned public walkways and residents want the DOT to make them more accessible by providing crosswalks and not allowing parking in front of them. Buses to Nowhere. Citing a Brookings Institute report, The Minneapolis/St. Paul Business Journal noted that though 67 percent of Twin City residents can walk to a bus stop from home, only 30 percent of the buses stop near their jobs. For metro areas nationwide, New York came in last while Honolulu came in first. The report counts Poughkeepsie as part of the New York metro area. Really? Poughkeepsie?